View local and related resources that are helpful to the East Boston community for residents and businesses. 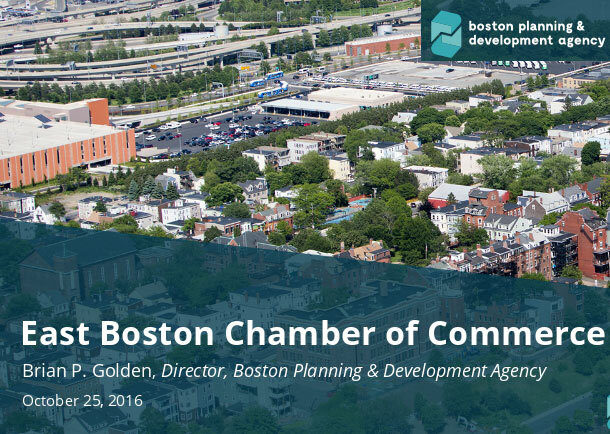 On October 25, 2016, the East Boston Chamber hosted Networking Lunch with Brian Golden event. Brian P. Golden is the head of the Boston Planning and Development Agency and over 70 attended. The event provided the opportunity to give residents and the business community in East Boston the chance to learn firsthand about upcoming projects, approved permits and future business growth opportunities. The event also provides the chance to network with developers and real estate agents. M-F, 9:00 AM – 5:00 PM.